This working cattle & horse ranch offers 106.33 +/- acres (with additional adjoining acreage available if desired) along with an awesome home. 4 beds & 4 baths with 9’6” ceilings on the main level and vaulted ceilings with knotty pines wood upstairs. Home can be split into 2; allowing for the upstairs separated and thus will serve as a fully functional 2nd residence, if you should desire. There are 2 kitchens, 2 laundry rooms. This house is finished to a tea. 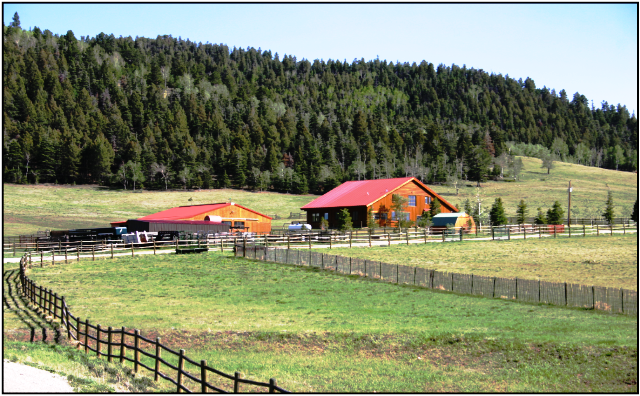 The ranch offers you some really nice pasture land, and also the chance to own your very own mountain. Fenced, with corral, a pole barn, a 48’ x 48’ Cleary barn with horse stalls, and an additional storage shed. The home is offers a total of 5752 square feet, including 2 separate garages, and 4696 square feet of heated living area. Wildlife abounds, and views are unmatched. This may be the one you have been waiting for, call to set your appointment, and then come take a look today! Copyright © 2013 Custer County Realty Inc.